You are invited to Commissioner Stebbin’s next monthly neighborhood luncheon on Wednesday, Jan. 25, noon to 1 p.m., at the McKinley Community Center on 3401 Monroe NE. This month’s speakers are Enrico Gradi, Director-BernCo Planning & Developmental Services, and Brennon Williams, Associate Director, City of Albuquerque Planning Department. 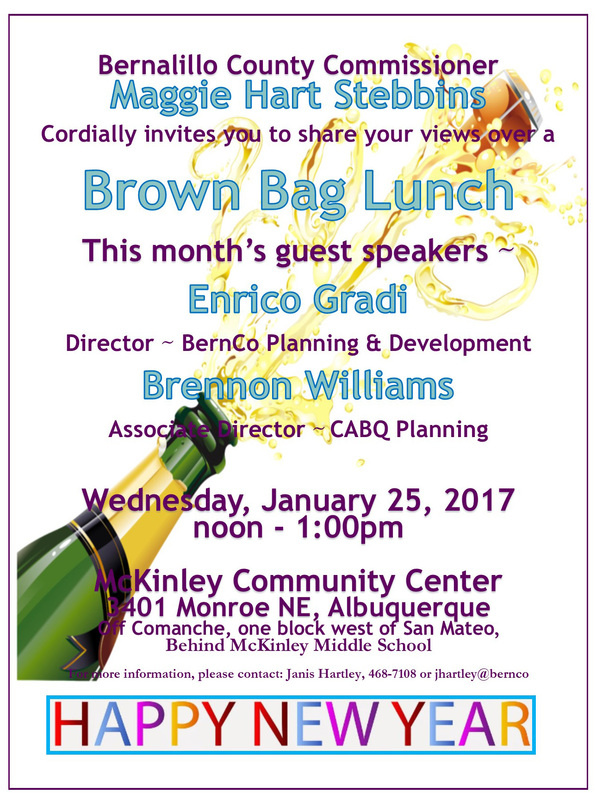 Enrico and Brennon will discuss and answer your questions regarding the Albuquerque-Bernalillo County Comprehensive Plan and ABQ the Plan. The City of Albuquerque and Bernalillo County have created ABC to Z — an ambitious, two-year project to update the Albuquerque/Bernalillo County Comprehensive Plan, and to integrate and simplify the city’s zoning and subdivision regulations. ​Key goals of ABC to Z are to improve opportunities for economic development and job creation, improve protection for the city’s and county’s established neighborhoods and special places, streamline the city’s development review and approval procedures, and respond to long-standing water and traffic challenges by promoting more sustainable development. ABQ the Plan is Albuquerque’s long-term strategy for investing in the City and planning for a future with new opportunities for the community. The goal is to craft a vision as a community while developing a long-range plan for quality of life projects. ABQ the Plan began in 2010, and currently several projects are underway and the City is moving forward on funding for additional projects.